Light, cotton-soft, fluffy, and melts-in-the-mouth delicious. 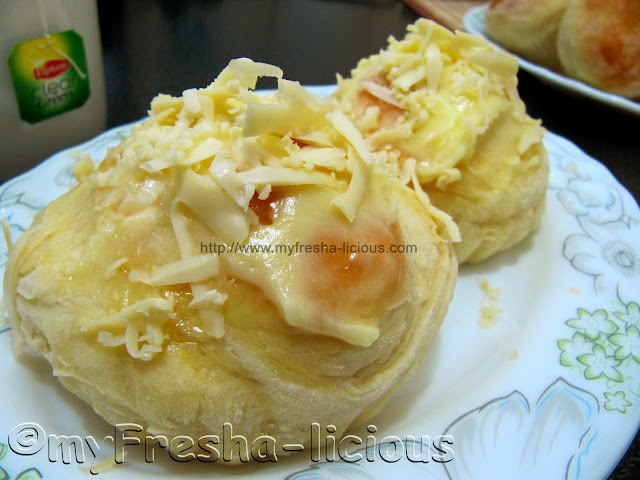 Those were the exact words of my husband while eating and enjoying this wonderful ensaymada. Thanks to a good friend Richard Ramos who happens to be a baker/demonstrator at my previous company in the Philippines - Puratos, for the great recipe. Ensaymada is a sweet bread that is very popular in the Philippines. It is almost similar to the ensaimades of the Spanish. The difference between ensaymada with the other soft breads in the Philippines is that, ensaymadas are expected to be soft, fluffy, and buttery while other sweet breads need not to be too soft. 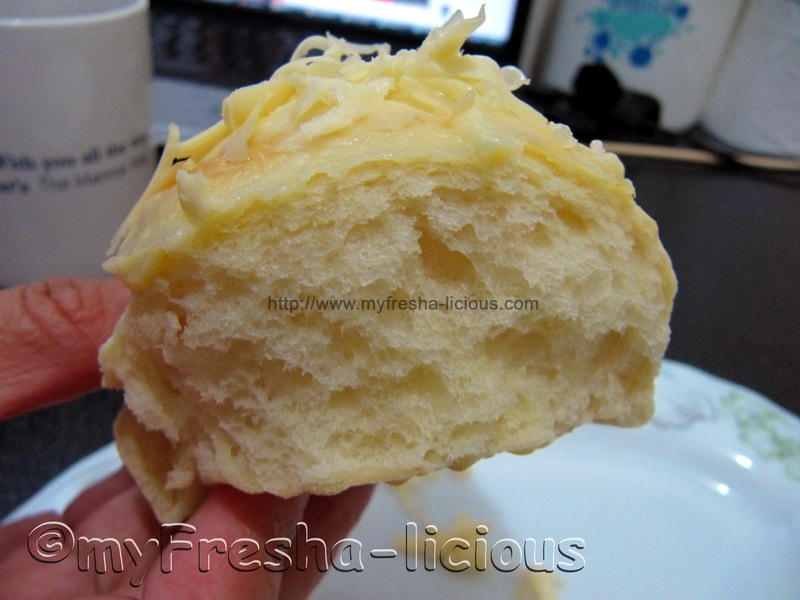 Almost 2 years ago, I had posted another ensaymada recipe which I baked when we were still living in Singapore. See Ensaymada for the recipe. Since bread improver is available at Phoon Huat (the name of the store in Singapore where we buy all our baking needs), I was able to make a cotton-soft, fluffy, and delicious ensaymada using the straight dough method. Mashed Potato - 80 g.
1. In a large bowl, mix all the ingredients for the sponge using a wooden spoon or your hands. Cover with a plastic and leave in a warm area (no direct sunlight!) for about 2 hours. 2. In a mixing bowl (the bowl for your mixer), under low speed, mix all the dry ingredients for the dough. Add the mashed potato. Mix. 3. Pour in the fresh milk, egg yolks, and butter. Mix at low speed for 2 minutes until incorporated. 4. Add 1/3 of the sponge to the dough and mix at high speed until just incorporated. 6. 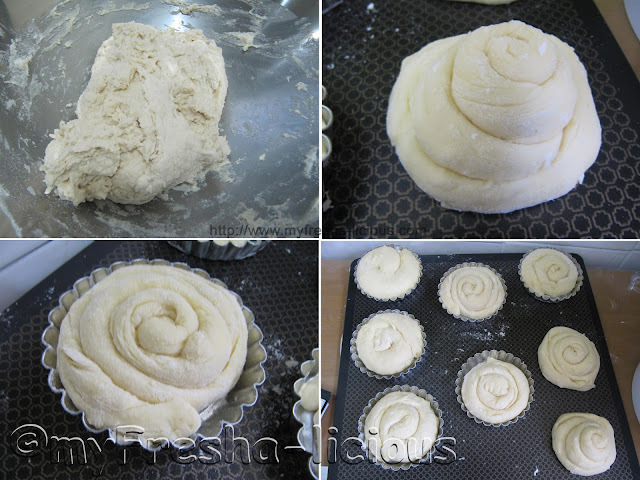 Cut and scale the dough to 70 g. then roll it into a rope, then form it into a snail. Do that for the rest of the dough. 9. 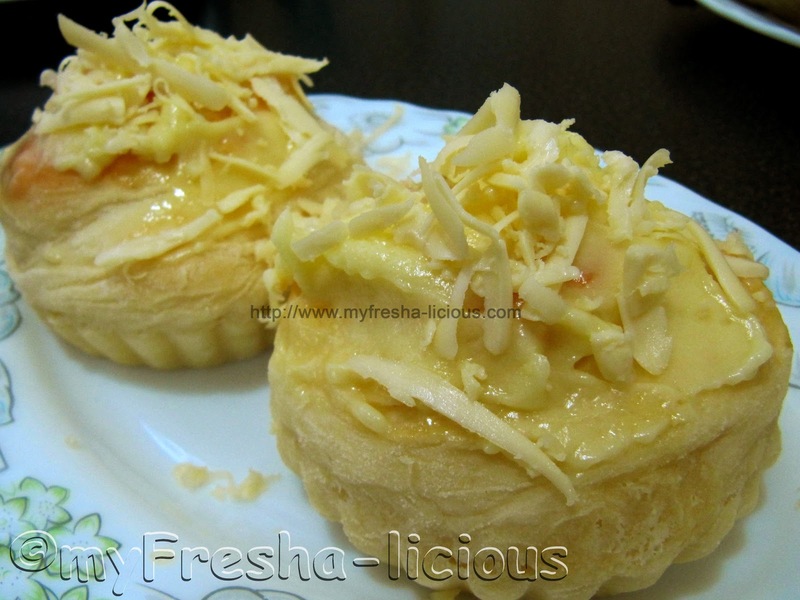 Brush each ensaymada with egg wash. NOTE: The final dough will be somewhat soft and sticky, BUT it will still be manageable. Here's a few tricks I developed as I went on baking using this recipe. 1. Scale and cut the dough then roll it out into string on a floured working surface. Mix all the ingredients in a mixing bowl and cream them at low then high speed. How do you mix the sponge and dough recipe? In your procedure above after mixing the dough recipe you proceeded to scaling ang cutting the dough. Hello can i still use bread improver in this recipe? And ifever how much? Hi. Yes you can use bread improver. I recommend Puratos' Soft'r Cotton. Based on this recipe add 1 tsp to the dough (not the sponge). Mix the improver with the dough's dry ingredients first. I think rhe recipe above lacks liquid/ water. I tried mixing both the sponge and dough and it was only during the mixing that i noticed that there is wrong in the consistency for its almost all dry ingredients. I would appreciate it much if you can go over the ingredients and check if liquid/ water is missing. I think so too. When I did the sponge it was so dry that I has to add 1/4 cup of milk. Hi. The measurements I provided in the recipe is correct. The total liquid (fresh milk + water) excluding the egg yolk is already at 60% (that is a lot - the usual is usually from 30-45% depending on the flour). Even if you used bread flour or with a high protein flour for this recipe, the resulting dough would still be wet, that is if you followed the recipe above. Please check your process again. By the way, how did you measure your flour? I think you may have added too much flour than needed. an extra 10 grams of flour makes a big difference. where can i buy puratos improver? Hello... am inlove with your ensaymada...i wana try making it... would i get the same texture and fluffiness of the bread without using a mixer? Hi! Is the butter melted or just in room temperature?Thanks. You didn't explain what did you do in your sticky unmanageable dough. How did you make it manageable and able to coil without sticking? Did you add more flour and knead it? Hi, can I do this w/ bread maker machine? Hi, can i use bread flour instead? Is it the same measurement? Thanks! what's 80 grams to a cup. and please tell what you did tomake the dough manageable? and did you use uncooked mashed potato? hi.. can i ask what is the difference between instant yeast and active dry yeast?? because other recipe in making ensaymada active dry yeast is thyr using and using tht i need to huv lookwarm water then put the active dry yeast and add sugar leave it 4 about a min. until bubbled.. should i follow this procedure in using instant yeast or not?? Active dry yeast and instant yeast are different. For active dry yeast you need to activate it using lukewarm water and sugar. For instant dry yeast you can mix them directly with the rest of the bread ingredients. If you plan to use instant yeast, just follow the procedure as dictated in my recipe. Mix the instant yeast directly to the ingredients as directed. I'm glad you liked my ensaymada:-) happy baking! 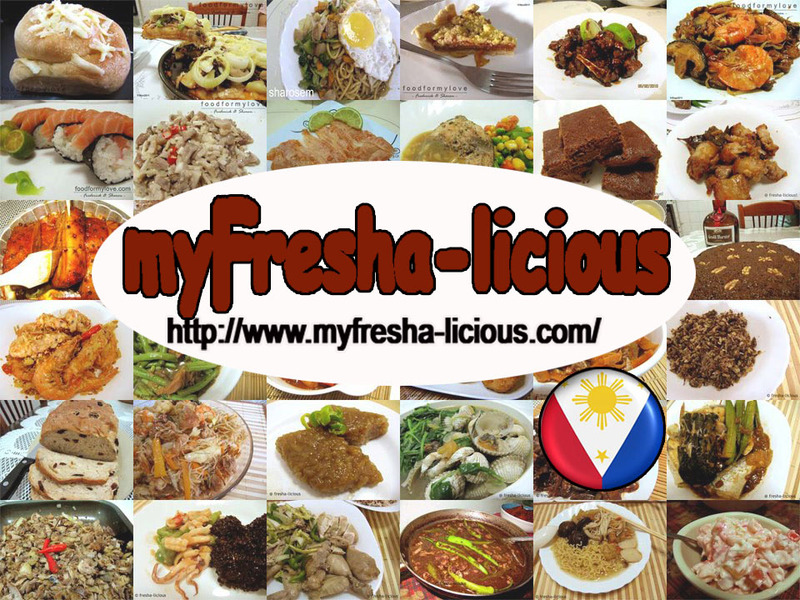 Hi thank you so much for the recipe it is really soft and fluffy..nde sya mahangin. super nagenjoy po ako while baking.this is my first time to baked ensaymada and perfect tlga.i followed your instructions. thank you so much. hello there. I tried this recipe and it was really delicious and soft. I made this for my 90 Chin refugee students ( made 2 1/2 batch) just now and I'm sure they will love it. So in a way, you were able to help out too with your recipes. In behalf of my students, thank you and may God continue to bless you so you can be of more help to others. 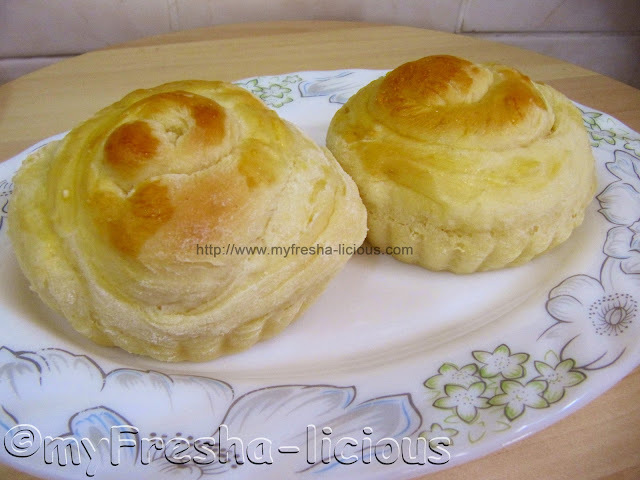 I have been searching and tried for a good ensaymada recipe! Iam really excited to try your recipe! I have a few queries though....Do I need to prove the dough??? If not, I can only start mixing/preparing my dough after my sponge has proved for 2 hrs? hi can i substitute the all purpose flour to bread flour? what could be the exact measurement? i have no milk powder, what can i substitute instead? I just tried this today. Really soft and fluffy! It actually doesn't need any improver at all! Thank you for the recipe! Hi. Im doing it right now. :) And for the sponge, may i just ask what should be the consistency? Coz mine is not wet. hi she wolf, sorry for this late reply. How's your ensaymada? :-)as to your question, the sponge should be wet and the resulting dough should not be as wet as the sponge but still sticky. It turned out good. However. Its like like ball of dough. It's not sponge like looking. I tried to do half recipe and whole recipe end results for both were still the same. hi, i suggest to do half of the recipe if you are kneading byhand so that it will be manageable. knead the dough (sponge and dough mixed together already) for at least 20 minutes, you will notice that the dough is smoother in texture by then. is the end result of the dough (sponge and dough mixed together) after 20-min kneading by hand be sticky pa rin or smooth to touch? thank you in advanced! Hi, I didn't find the bread improver added on your list of ingredients. I've never bake bread so I am wondering maybe your ingredients do not need bread improver? I think I can buy bread improver in the US if I need it. hi i am so amaze how the result of this recipe. it is very fluffy and soft, but just i have to add little bit of the liquid during the sponge stage coz it turns very stiff. i think measuring by volume is tricky than measurements in grams. but all i can say it turns out so well. im happy i found your blog. but can i make a request if u can give the measurements in grams. i will really appreciate it. 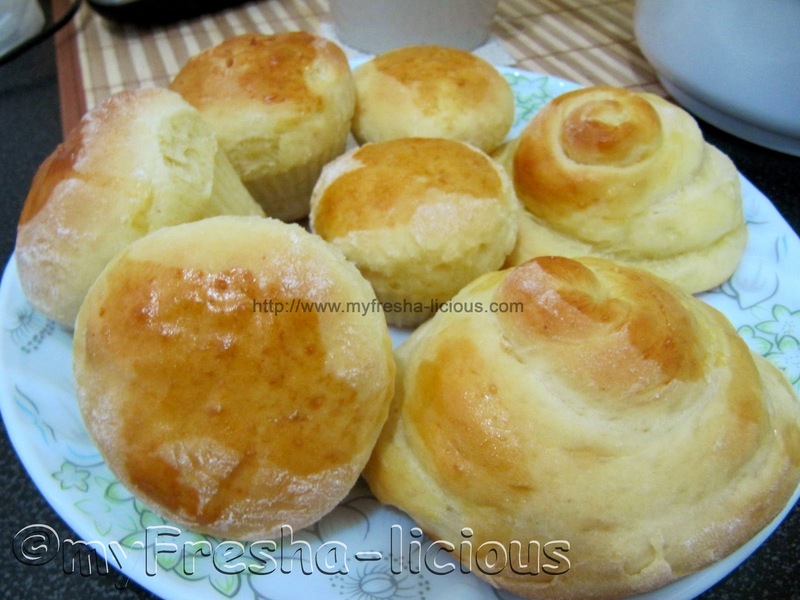 thank you for sharing an excellent recipe for ensaymada. Hi. want to make sure is it all purpose flour or bread flour?